When the season is ripe for Golden, Smooth and Yellow Chanterelles, Horn of Plenty, Black Trumpets and Boletus edulis and other great boleti you will often run across these mushrooms during your forays. Several mushroom books rate this mushroom as 'good'. I agree, and then some. I like the taste AND the texture. Of course, I take only the best specimens of the group for eating. I am of the opinion that texture also counts for something after the mushroom is cooked. And these have a lot of that. Nice and firm. Definitely, pleasantly chewable. These grow on the ground in open oak or oak/beech woods. Often they can be found in the grass in well maintained parks that have many oak trees. Sometimes there will be a few, other times there will be oodles of them. I never refuse to take the best of them. I like to be picky when choosing mushrooms for the pot since I pick and eat so many varieties, so when I run across a large bunch of these, I take only those in perfect condition and of smaller size. Forget taking the stalk / stem unless the mushrooms are very young and small . The stems get tougher as the mushroom matures. Do with these what you do with Honey Mushrooms, cut off the stalk close to the gill surface. These are the size I like although with the stalks cut off closer to the gills. The cap color is dirty light tan, sort of like chamois leather. The surface texture is scraggly appearing. 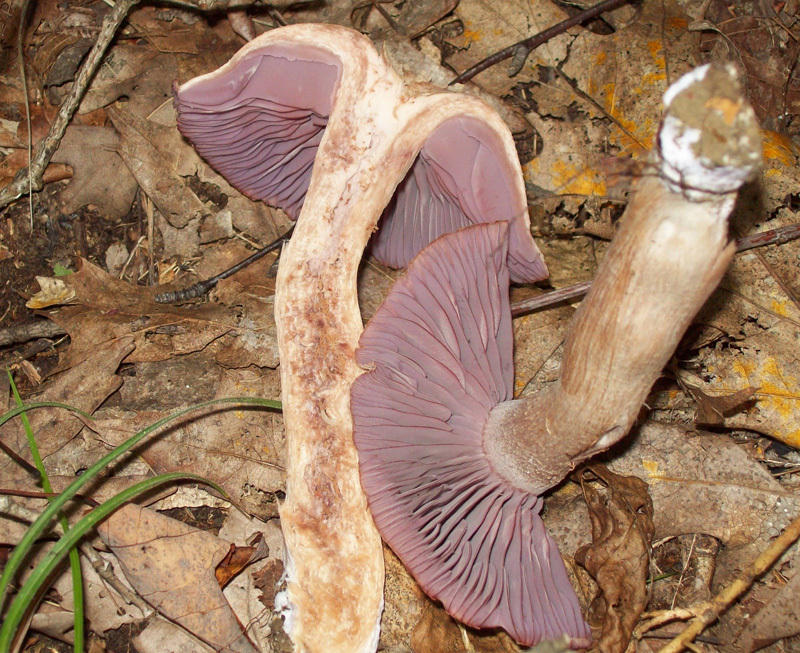 The coloring and surface texture of the stem / stipe is similar to the cap. So whatever color, hue and texture the cap ends up with, the stem is right there with it. The stems can be short or long. Mostly however they are on the long side and sometimes extra long. There is no appreciable thickness at the top or the bottom of the stem. It is usually pretty even throughout it's length. It will be rough appearing, scraggly like the cap. 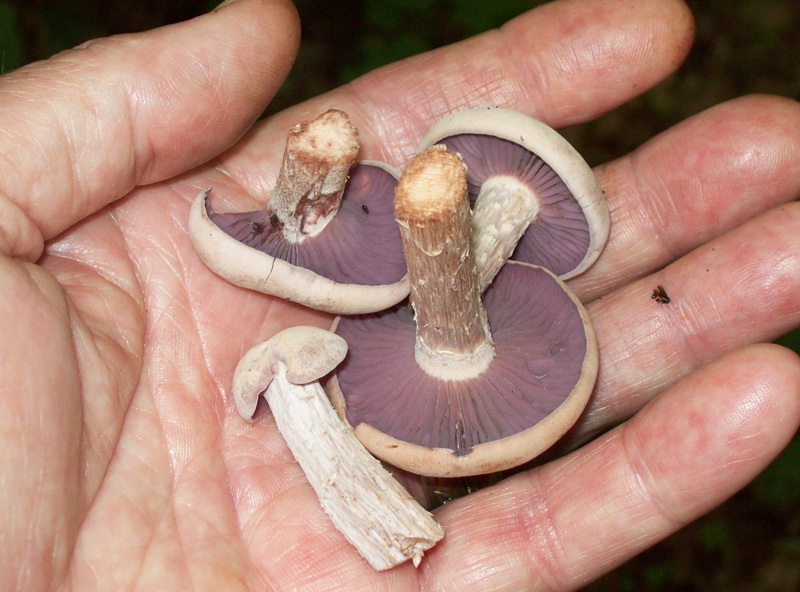 The gills are purple, broad and thick. 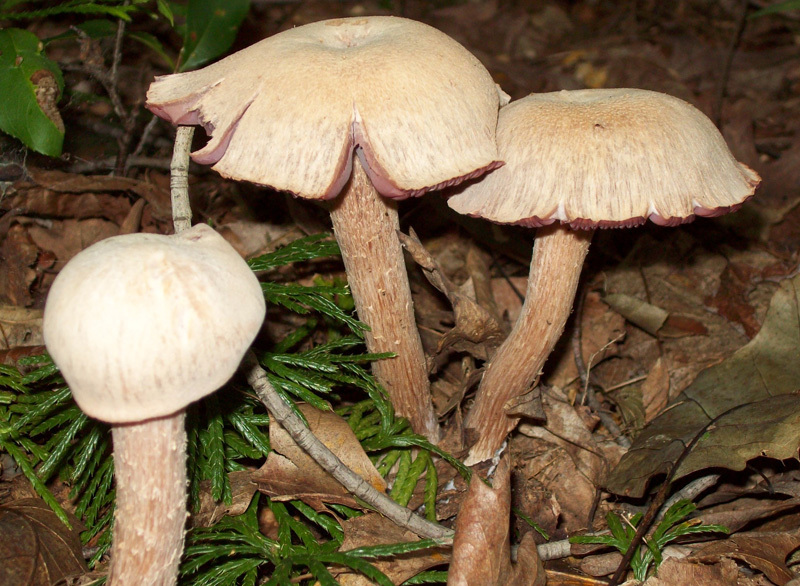 The gills are adnate ( broadly attached to the stem ). 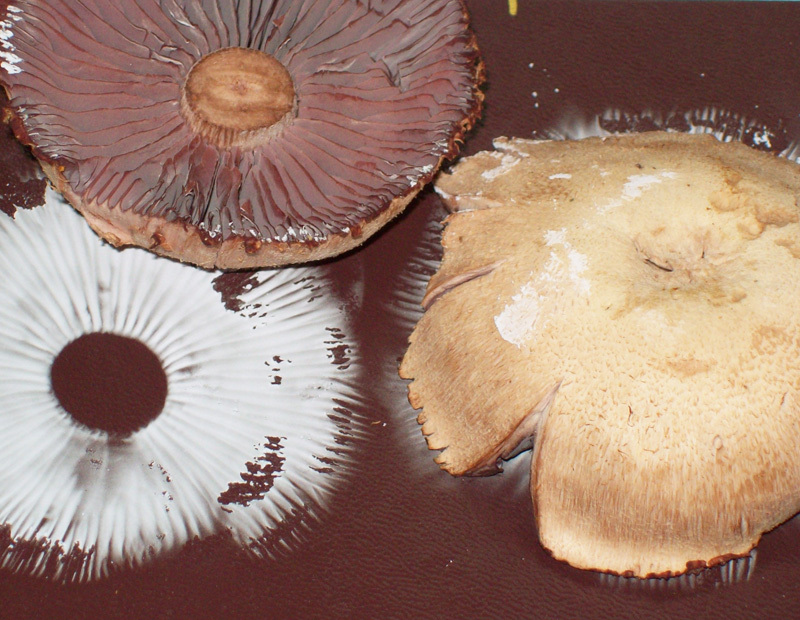 Spore print is very pale lilac to almost whitish. On dark paper it looks white but all gathered together it has a definite lilac hue. ( once you know these WELL they will be easy to remember and spore printing won't be necessary ). 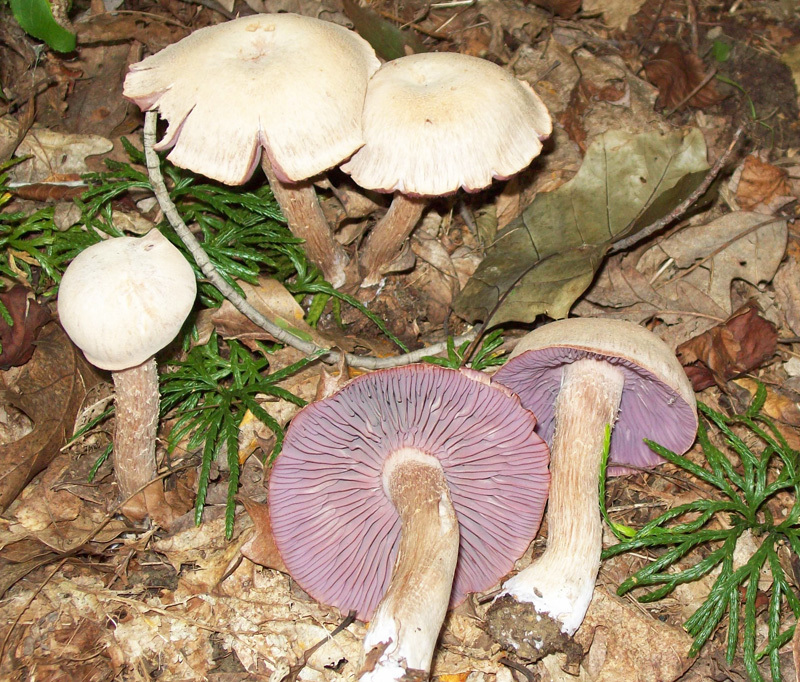 The spore print will eliminate the Cortinarius genus, which has some species that may look similar. 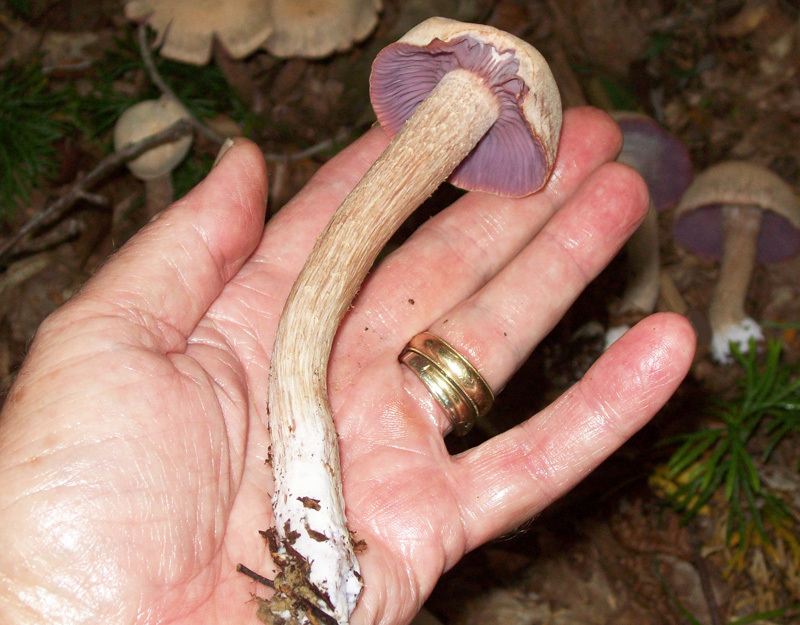 Cortinarius has some 'bad' mushrooms. Best not to fool with that genus. That bad genus has rusty brown to cinnamon-brown spores so getting a white spore print is essential. These are easy to clean and they cook up fast. Also, because the stems are usually so long and because you should eliminate the stem anyways near the gill surface, you will have essentially gotten rid of almost all the larvae that have tunneled up the stem. I like medium-high heat with a little olive oil / butter. Suits me to a tee. These are great in stew, goulash, stroganoff and spaghetti sauce. 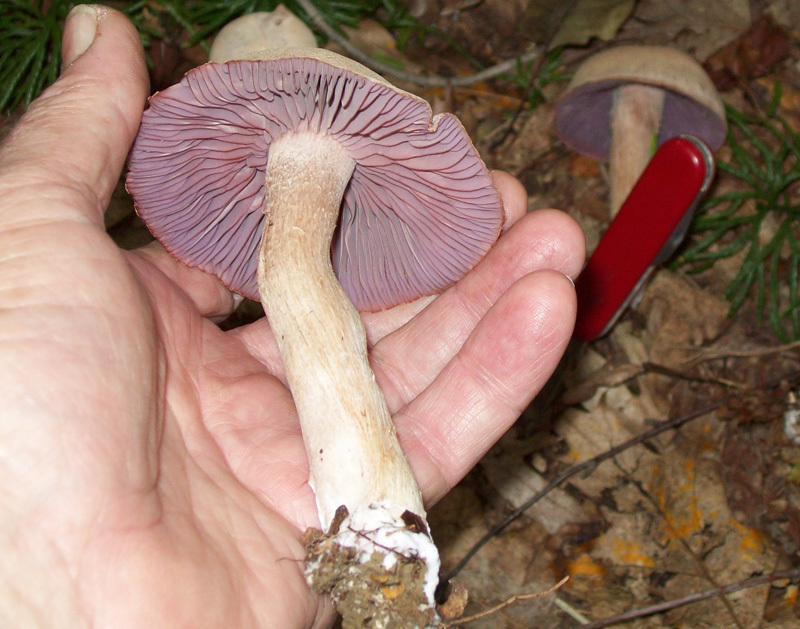 Laccaria ochropurpurea - A/K/A - Purple Gilled Laccaria . DATE - July 28 to August 12. FOUND - Laurel Hill State Park, near Bakersville, Pennsylvania. Camp Conestoga ( Boy Scout Camp adjacent to the State park, Buck Run Road - near Fly Fishing only area still in Boy Scout area ), Bob's Run in Laurel Hill State Park / Boy Scout area. In all places they were in oak woods, that is, the trees were predominately oak. Also, various places in the Forbes State Forest where certain areas are rich in oak and/or oak /beech trees. Weather conditions: It has been very hot and dry in 2012. However, where they have grown in the past they appeared again notwithstanding the dry weather.